The American tenor saxophone artist Dexter Gordon (b. 1923) was working on his autobiography in Cuernavaca, Mexico, when he died in 1990. Maxine Gordon embraced the role of family life historian to complete this work. This is the biography of a legendary jazz musician written by a woman who had served as his road manager and business manager before their marriage; and Maxine earned academic credentials and black history writing experience post-1990 to strengthen the writing. The period of Dexter’s life during the 1950s was too painful for him to address when he was the story writer; but Maxine chose to write her take on the events too dark for him to rethink and organize. She deemed this period relevant to any tale of her man’s life and legacy. To that extent this relatively small book is a full account. The father of Dexter Gordon was one of the first African-American medical doctors in the growing city of Los Angeles. Many of his patients were jazz musicians. In addition to a middle-class upbringing for young Dex, it didn’t hurt that the parents hosted musicians regularly at the dinner table. One of Dexter’s friends was the younger brother of Marshall Royal, multi-reed player in the Lionel Hampton Band. At age seventeen, Dexter was offered a tenor saxophone position in the Hampton band. With that, formal schooling ended and life on the road began. Gordon moved on to play with the big bands of Louis Armstrong and Billy Eckstine. Interview material collected by the author revealed reasons for this big band hopping--habitual tardiness, “Louis’ songs,” and the need for freedom. When he died, Dexter had in his notebooks a play written about the Eckstine bus touring the country with musicians napping, eating, practicing their chops in the back of the bus, playing cards, or just looking out the window at 1940’s America. Those musicians included bebop pioneers Gene Ammons, Gordon, Dizzy Gillespie, pianist Johnny Malachi, and drummer Art Blakey. The notes written by Gordon, and conversational material shared with Maxine while seeking alternative health remedies in Cuernavaca, served as material for this book. The reader will find original passages written by Dexter italicized in block paragraphs. The reduced formality of the New York improvisational bands and the emerging bebop style of play better fit Dexter’s personality. But, the Los Angeles and New York music worlds came with impediments. Gordon’s first incarceration was to a Chino, California low security prison where he says he “was saved”; apparently, this time helped him get his life together. At this time there were eight arrests on his court records. He was convicted of trespass and theft per Maxine’s research. The California Health and Safety Code statute 11721 empowered police to arrest people “… merely for having needle marks (tracks) on their arms or showing signs of having drugs in their system (internal possession),” writes Maxine. After numerous detentions, probation periods, and paroles, Dexter was finally freed from the California correctional system in 1962 and able to choose to leave the state. While incarcerated, he did have opportunities to make music and mentally rehearse his approach to art. Favorable outcomes following adverse events he called his “phoenix rising” moments. Dexter had his European debut with a short gig in London, but Scandinavian clubs, especially a cafe in Copenhagen called the Jazzhus Montmartre, provided the more steady work. Gordon toured Europe for club dates and made records. Aside from some trouble he got into in France, his ex-patriate period from 1962 to 1976 was rewarding time for long, tall tenor Dexter Gordon. 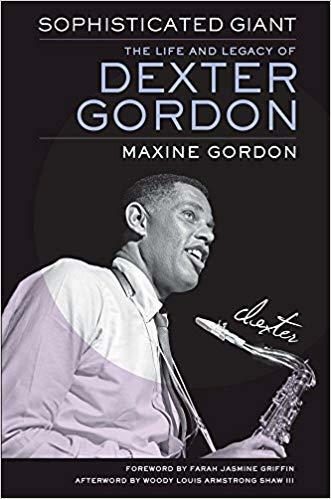 The author provides a quote from a notable interviewee to preface each book chapter; many of these are Dexter’s peer musicians, namely Jimmy Heath, Sonny Rollins, and Dizzy Gillespie. Dexter had a fine relationship with the Blue Note co-founders Francis Wolff and Alfred Lion as evidenced by copies of letters provided and accompanying black and white photos. Additional source material came from Bruce Lundvall and Michael Cuscuna of Columbia Records. Dexter’s return to America began a period of financial stability thanks to Columbia recordings and steady billings at the Village Vanguard and Keystone Korner. And, he became a film star. There is boundless praise for Dexter’s acting skills, highlighted by his Oscar-nominating performance in the film Round Midnight. He plays an African-American jazz musician in Paris, a role loosely based upon the composite experiences of pianist Bud Powell and others. Maxine was in Paris on the set for this film making segment of Dexter’s life and the book content here is rich. The film music was recorded live on constructed night club movie sets; nevertheless, the sound score arranged by Herbie Hancock won an Academy Award. The good times prevailed-- laughs, parties, Hollywood, and a night at the Oscars. This is a story that had to be told. Gordon, Maxine. Sophisticated Giant: The Life and Legacy of Dexter Gordon. University of California Press: Oakland. 2018. Robbie Robertson had a music band while growing up on the Six Nations Indian Reserve in Canada, but he owes his professional music origins to two guys playing rockabilly and blues covers in the Arkansas Delta region. At age fifteen, Robertson gave two songs he had written to Ronnie Hawkins and the Hawks after his band had opened for a Hawks performance in Canada. Returning to Arkansas, Hawkins recorded these songs for a new album. Hawkins invited his young composer/guitarist discovery to Fayetteville for a crash course in rockabilly guitar playing.